Once again we will be running a Winter Championship to be contested across the race meetings held in November, December, January and February. The best 3 results to count. Entries are open to both members and non members for the following classes:- Bambino, IAME Cadet, Honda Cadet, Minimax, Junior Rotax, Senior Rotax, Senior Rotax 177, TKM, 125 / 250 Gearbox. Please note that if more than 8 Rotax 177 drivers are entered then this will be run separately from the Senior Rotax (162) race. 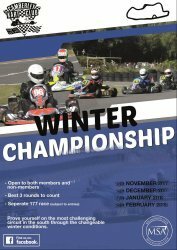 To enter or to review entries please use the following link http://http://www.camberleykartclub.com/online-entry.html or select the’Online Entries’ option at the top of the page. *** due to weather conditions!! *** The NATSKA event on the 3rd March has been cancelled. There will be NO practice on the 3rd either! This is due to freezing temperatures and ground conditions.